At Apple’s extremely comprehensive, two hour-long keynote event, the first-ever event at the Steve Jobs Theater, CEO Tim Cook and other heads of the company gave viewers a first look at their new campus and retail layout, and unveiled upgrades to Apple Watch and AppleTV, as well as revealing the new iPhones. 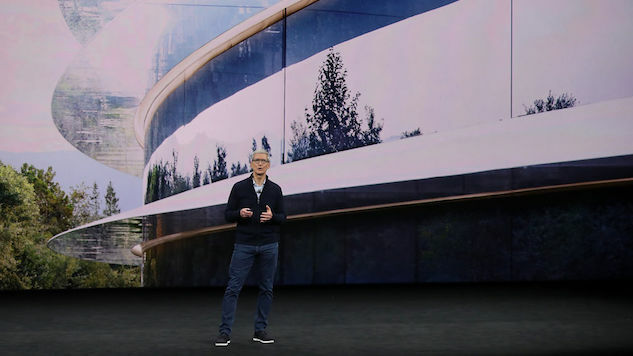 The Steve Jobs Theater overlooks the new Apple headquarters in Cupertino, Calif., called Apple Park, which is a futuristic location that Jobs envisioned where employees create the next generation of technology. It includes 2.8 million square feet of space and one of the world’s largest solar installations, using 100 percent renewable energy. Along with a new headquarters for Apple’s employees, the company also announced a new retail experience for its consumers. The Apple stores in the largest cities will be reworked into layouts resembling town squares. The purpose of the Apple Town Squares will be to serve as forums for collaboration by putting a greater emphasis on classes, workshops and socializing. The first big update announced in the keynote was for a new Apple Watch, the Series 3. It is the first to include LTE-compatibility and can function completely independently from cell phones. The newly swimproof Series 3 features a dual-processor that not only makes the watch faster than its predecessors, but it also allows Siri to actually speak, as well as a W2 chip that enhances Bluetooth and wireless connectivities. Along with the improved specs, Apple added major updates to the heart rate and music apps on the watch, also noting the new blush gold color and different band options. Pricing for the Series 3 with cellular starts at $399, and the watch without cellular starts at $329. With the new AppleTV 4K, the company introduced upgrades to the memory, as well as to the picture by using four times as many pixels than standard HD. Apple also announced that the 4K offers live content, including sports and news, and improved gaming capabilities, showing off a new exclusive game called Sky, coming to iOS and Apple TV in the winter. The new AppleTV will be able in a 32GB version for $179 and a 64GB version for $199. As expected, the iPhone 8 and 8 Plus have faster processors, better displays and more improved cameras than their predecessors. However, those are just three of the upgrades Apple added to their iPhones. One of the biggest changes is the new glass back, which allows for inductive wireless charging—now, there’s no excuse for having a dead phone. As for the camera, to go along with the 7’s “Portrait Mode,” Apple introduced “Portrait Lighting” to adjust the lighting for portrait shots. The iPhone 8 will be available in a 64GB and 256GB model, priced at $699 and $849, respectively, while the iPhone 8 Plus will be start at $799 for the 64GB version and $949 for the 256GB version. And now, the moment you’ve all been waiting for: Apple’s new iPhone X (pronounced “ten”). First and foremost, the most striking characteristic of the oh-so-exclusive iPhone is the fact that its display spans the entire front of the phone. To one-up the new retina display of the iPhone 8, the iPhone X will have a super retina display, featuring an OLED display that means higher resolutions, more pixels, the works. The edge-to-edge display also means the X will not have a home button, creating swipe features to replace all the button’s capabilities. To top it all off, Apple introduced FaceID to overshadow the already convenient TouchID, featuring a depth-sensing front camera that detects the user’s face to unlock the phone. More enhancements include an even better camera than the iPhone 8’s, even longer battery life, even faster processors, and last but not least, animated emojis. With all the impressive specs of the iPhone X comes an impressive price tag: $999 for the 64GB. There will additionally be a 256GB, priced at a whopping $1,149. So there you have it. The preorders for Apple’s new watch, TV and iPhone 8 start Sept. 15, and the products will be available Sept. 22. Preorders for the iPhone X will start Oct. 27 and will be available Nov. 3, just in time for the holidays.